Lourenço & Pham, 2010 from the Thien Duong cave in Vietnam. The two species were discovered 3000-5000 meters inside the cave system. This is a new record of distance from a cave entrance for scorpions. Two new species of scorpion belonging to the family Pseudochactidae and to the genus Vietbocap are described based on specimens collected in the Thien Duong cave, which belongs to the Vom cave system, in the Phong Nha–Ke Bang National Park, Quang Binh Province, Vietnam. The previously described species from this cave, Vietbocap thienduongensis Lourenco & Pham, 2012 was collected in the initial section of the cave (1500 to 1800 m from the cave entrance) and proved to be a true troglobitic element. The diagnosis of this species, only known from males, is completed based on females collected at 750 m from the cave entrance. The two new species described here were collected respectively at 3000 and 5000 m from the cave entrance and are also true troglobitic elements, very similar to V. thienduongensis, but showing some clear morphological differences. This observed situation suggests a possible case of speciation within the cave system, the first one ever reported for scorpions. The population found at 5000 m from the entrance of the cave is a total new record of distance from a cave entrance for scorpions. Lourenco WR, Pham DS, Tran TH, Tran TH. 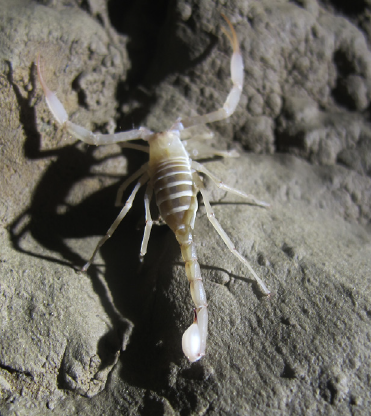 The genus Vietbocap Lourenco & Pham, 2010 in the Thien Duong cave, Vietnam: A possible case of subterranean speciation in scorpions (Scorpiones: Pseudochactidae).